Volstagg is a Marvel character who is a member of the Asgardian Race. He is a friend and compatriot of the hero Thor. Volstagg is most often attached to a group of Thor's friends called "The Warriors Three". In film Volstagg was played by actor Ray Stevenson in Thor and Thor: The Darkworld. 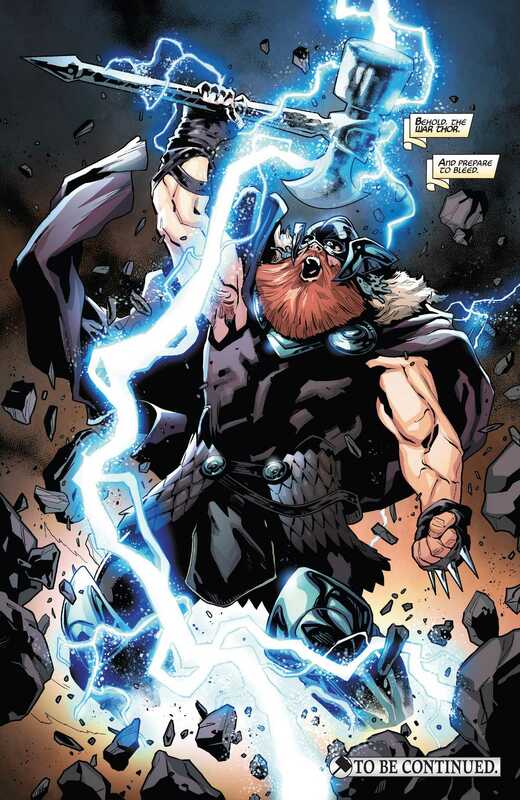 The Volstagg from the Ultimate's Universe is revealed to have picked up the Ultimate Thor's hammer and become War Thor. Check out Thor products at the Hammer Store. Toylab is part of Amazon Associates and offers from products through Amazon. We have highlighted some of our favorite Thor Toys and comics. If you want Thor merchandise now try looking in major retailers like Walmart, Target, Toys Ru Us, CVS and Walgreens. There are Heimdall toys for Thor Ragnarok including a Funko figure. Volstagg is a larger than life warrior who is physically one of the largest Asgardians. No warriors on Asgard are better at boasting and bragging than Volstagg though he sometimes has trouble backing up his claims. He calls himself the"Lion of Asgard". He is sometimes depicted as Oafish and bumbling through battles. Sometimes he causes far more problems than he fixes. He is gluttonous and eats and drinks many more times than he should. Despite his faults he is noble and loyal to the death to his friends. He also shown to be a doting, and loving father. In some stories it has been suggested that Volstagg was once one of the greatest warriors of Asgard but lost his edge (and physique) as he grew older. Volstagg met the other members of the Warriors Three during a bet to pet the wolf monster Fenris. The wolf deals all three warriors a bitter defeat. A.I.M. 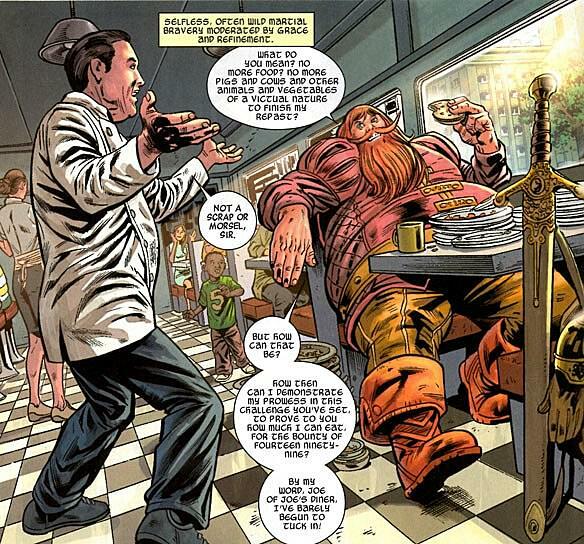 analyzed Volstagg and believed that it was shame from this loss that perpetrated Volstagg's poor eating habits. Volstagg has had many adventures with the Warriors Three, the warrior goddess Sif, and Thor. He has battled Mangog, Thermal Man, Surtur, Mogul of Mystic Mountain, the Destroyer, Loki, Flying Trolls of Thryheim, Fafnir, Mephisto, Hela, Ego-Prime, Xorr, Ssthagar's Slavers, Mercurio, Zarrko the Tomorrow Man, Spoor, Grey Gargoyle, Enchantress, Skurge the Executioner. Once Volstagg squared off with the Hulk. He lasted for a time before being tossed into a road side ditch. 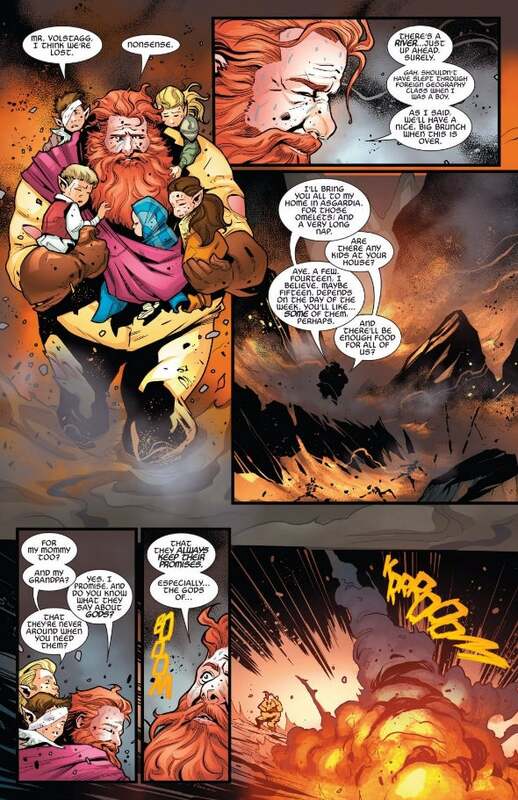 Unlike the other Warriors Three, Volstagg is a father. He has 2 Asgardian children; Hilde and Rolfe. He also has adopted to Midgardian (Human) children; Kevin and Mick. Both Hogun and Fandral have pledged to look over the children as well. As a family man Volstagg has a soft spot for children and been shown to commit to near suicidal acts of bravery to save innocent children from harms way. He once killed a group of alien monsters with his bare hands attacking a small girl. 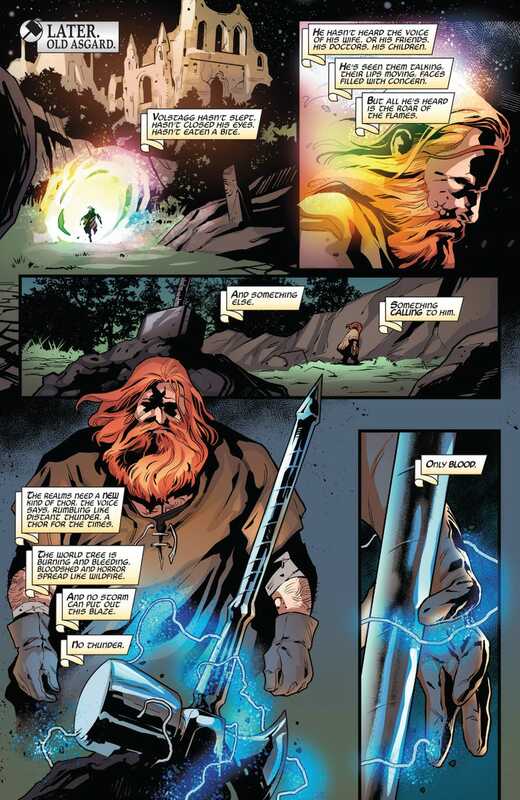 Volstagg perishes in Ragnarok but is found reborn like most of the Asgardians by Thor. "Behold the War Thor and Prepare to Bleed"
In the events of Unworthy Thor, Thor now going by the name of Odinson is searching for a new hammer after his original hammer is taken up by Jane Foster. Jane Foster takes up the mantle of Thor and Thor goes by Odinson. Due to the fluctuations of Secret Wars another hammer of Thor is found in the universe believed to have come from the Ultimates Universe. Odinson and Beta Ray Bill set out to retrieve the hammer against a backdrop of many villains who are also hunting for the hammer. In the end, Odinson decides not to use the hammer. Another Asgardian goes to the hammer and picks it up and begins to call himself War Thor. 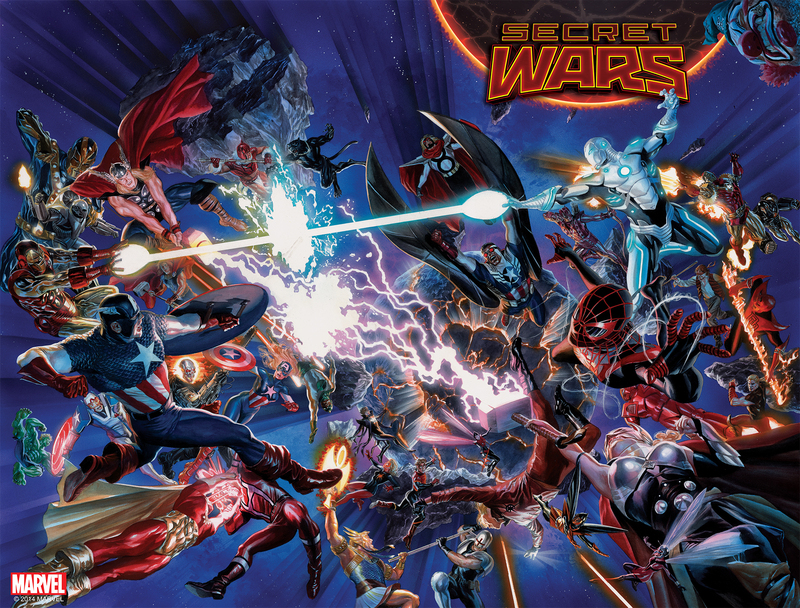 This War Thor is revealed to be a war ravaged Volstagg from the Ultimates Universe. This Volstagg has lost his children due to war and has grown cold hard and is brutal. Volstagg always had one of the biggest hearts of all the Asgardians but this version of Volstagg has had his heart ripped out and stomped on. Though generally past his prime Volstagg has shown bouts of extreme strength and fighting prowess. He has briefly gone toe to toe with the Hulk and has slain Monster aliens with his barehands. He is considered to be one of the best drinkers and storytellers on Asgard. In film Volstagg was played by actor Ray Stevenson in Thor and Thor: The Darkworld.